Wholesale IPTV allowing CipherKey Partner ISP’s to offer residential TV service across BC & Alberta. Internet service providers can double monthly profits from users who subscribe to both internet and TV. Additional services help to compete better and retain customers longer. The CipherTV service features an intuitive modern design with an electronic programming guide, video-on-demand, parental controls and more. Advanced network PVR, 7-day replay and mobile TV everywhere features will be commercially available soon. The entire CipherTV system is built easy-to-manage directly from your ISP Manager portal. CipherTV set top boxes are designed as plug-and-play devices. 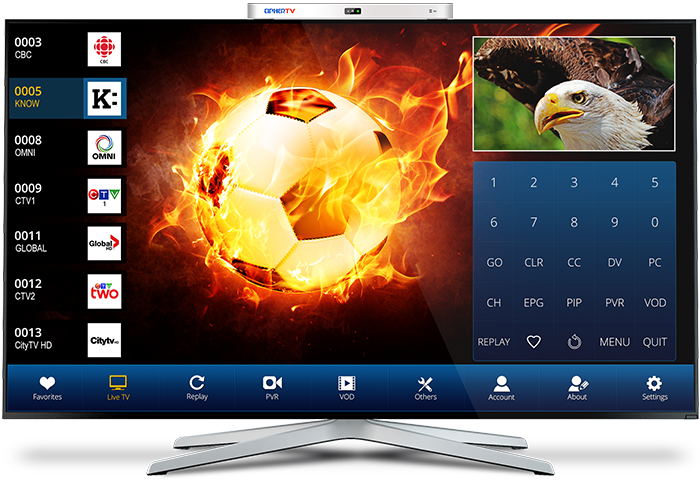 CipherTV is a compliant system offering legally licensed content and operating under a CRTC broadcasting license. CipherTV service is currently available through using the CipherTV set top box. This hardware features Google Play marketplace for apps and is available to order with wholesale volume discounts. CipherTV subscribers must have an internet connection that is either ordered directly through CipherKey or on a network that is pre-authorized and cross-connected with CipherKey. HD channels on CipherTV require a minimum of 5Mbps internet speed per TV. All end-user billing for the CipherTV service is done by partners themselves, with payment remitted back to CipherTV. TV services must be billed and offered only under the licensed CipherTV brand, not a private label. CipherTV does not sell direct to retail – all sales inquiries are forwarded to our partners. CipherTV is available everywhere in BC and Alberta, and across Canada in rural markets to customers who are ‘on-net’ with CipherKey. If you are reselling CipherKey internet services then your internet users already qualify. If you have your own network, you can cross-connect with us at one of our standard meet me points, or contact us for other options. CipherKey Datacenter- 970 Burrard St.
Westin Building – 2001 6th Ave.